Is there a way around the manual fuel transitioning between the EV-2L(s) and the propellant kits? The heat shields are preventing direct fuel flow towards the poodles. ....The heat shields are preventing direct fuel flow towards the poodles. Is there a way around the manual fuel transitioning between the EV-2L(s) and the propellant kits? Unfortunately, no. Whenever I'm doing a long burn with the 'Windjammers' I have the EV-2L's fuel tank open and pinned, and systematically transfer propellant to it. Thanks. Truth be told, making a new video is on my list of things to do. That vid was made a few months before 1.4 dropped, and it makes me cringe seeing some of those older designs. That skycrane for example looks night and day better. Well, it's just a matter of automatic vs manual crossfeed. KSP allows a player to manually transfer fuel across it (provided you don't have it restricted in the settings), just doesn't do it automatically. You should consider adding that information on the KerbalX site and/or M3V section in your opening post. People might get confused. Because roughly 1,900m/s i dicated dV is nowhere near the actual dV. Well, to be fair, the stock dV functionality itself is also inaccurate under a number of conditions. Engine plates from the DLC pack for example don't play nice with it. The way my current EV-4's are built, I get 0 m/s dV with a fully-fueled NTR stage burning away. Even so, the EV-4's have always suffered from this consideration during the initial burns away from Kerbin. Having to drain the drop tanks to the in-line/NTR tanks so that they could be jettisoned away first to dump mass. I'd like to point out that when KSP (and MechJeb, if applicable) fail to pick up on fuel for accurate delta-v calculations, one can refer to the Tsiolkovsky equation to calculate what the true delta-v capability would be. Note: Both LF & O are 5 kg per unit, so for a fully-fueled spacecraft, final mass would be the initial mass (in kg) minus 5x the sum of LF and O capacity of the spacecraft. For nuclear-powered stages, LF is just counted (since nuclear engines don't need oxidizer and therefore oxidizer is just dead weight). Using the formula, I calculated that the delta-V of a fully-fueled EV-6H Heavy Windjammer would be ~3,370 m/s. Single craft update today. The 'Olympus 1' launcher (Saturn 1B analogue) has been sort of broken for quite some time and it was never a priority to fix it. But, I believe I got it working better now than before. I lightened up the first stage a little and replaced two of the LV-T30's with LV-T45's for some gimbal steering. The rocket still needs the winglets for assistance in attitude control, but at least it has control now right off the pad. The rocket still has poor TWR compared to most of my lifters, but it's still more than capable of putting an EV-2A in LKO; you just need to pay attention to your ascent profile more than other rocket configurations. 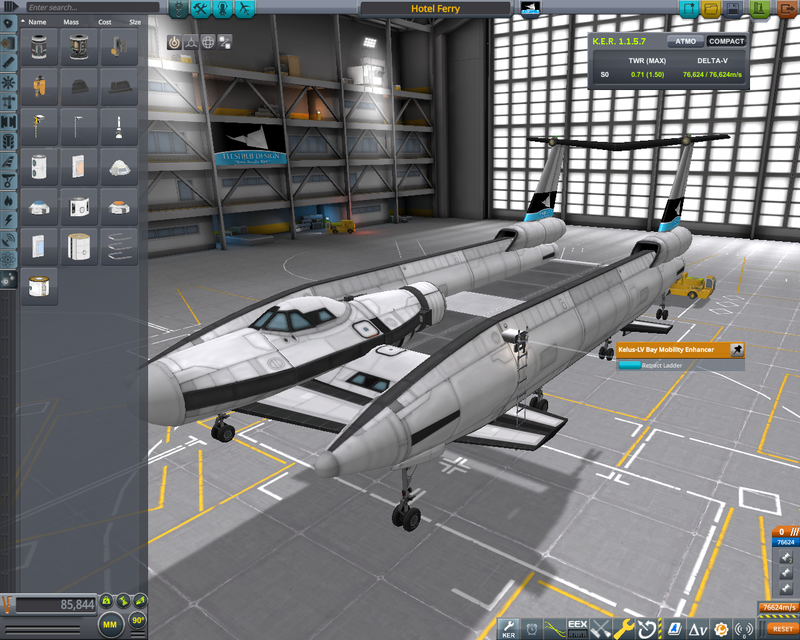 In other news, I'm considering doing a revision of my SVR-20 'Ranger' (Shuttle analogue). The main deficiency is the fact that I designed the darned thing as a "station builder", but with a payload "window" of 10 to 30 tons, with 20 being the ideal payload mass for balance. In other words, due to the asymmetric nature of the shuttle design, anything less than 10 would suffer moderate to severe control problems during ascent. Add to that it really didn't glide very well with very much payload in the bay on the way back down. I took a closer look at all my SM station subassemblies. The heaviest module was 5 tons, with the average being 3 to 4 tons. Of course, there are some modules that you could bring several up on one launch, but rarely would you ever need more than 10 tons at one time. For a comparison, a 'Thunder 4 Heavy' can launch 45 tons to orbit easier and for the same price as the expendable portions of the SVR-20 launch stack; but again, rarely would you ever need that much mass to LKO in such a small fairing. So I figure let the 'Thunder 4 Heavy' and 'Titan' rockets do the heavy-lifting so to speak, and re-optimize the SVR-20 for what it's really supposed to be doing: building stations in low Kerbin orbit. This will require a rework of the entire stack to ensure proper CoM/CoT balance within acceptable margins throughout all phases of ascent, not to mention making some tweaks to the airframe itself. Even the OMS alignment will require adjustment. So, since I'll be making a huge invasive revision into the design (which will take some time), I'm going to set some additional goals for myself while I'm at it. When you tear apart a shuttle design, the last thing you want to do is do it again any time soon. 1) Primary Goal: Reduce payload window for ascent down to 0-10 tons, possibly 0-15 tons if I can manage acceptable control margins. 2) Primary Goal: Increase stability and control for less player workload maintaining ascent path, or making launch path adjustments mid-ascent for inclination trimming. 3) Secondary Goal: Reduce on-orbit part count. Currently stands at 99 (and that's just the orbiter itself), would like to drive it down as much as possible to delay the "yellow clock". 4) Secondary Goal: Reduce overall launch costs if possible. 5) Tertiary Goal: Adjust glide performance to permit returning payloads from orbit with better control during final approach and landing. No timeline on any of this, this will be my spare time project when I'm not playing KSP career; and I'm not exactly in a huge rush to crack the hood open on the SVR-20 anyway. Interesting take on your shuttle design. I basically just give up on doing the STS as a we received at the end (despite my Orbiter Space Station), but instead I ended up looking at the earlier proposals, where there is only two stages: the flyback booster/disposable fuel tank, and the shuttle itself which only have a CRG-50 (CRG-75 for the KLAW -- still testing). Of course, the main reason why most people aim for 34t is more or less the use of Orange Tank for testing. That, and the nuclear shuttle (of original STS, aka your EV-3) was suppose to be launched on the space shuttle. Would it be too much of an impact on performance if you use 4 Swivels and Reliants each? Just asking because the S-IB had 4 of the outboard engines mounted on gimbals. I lightened up the first stage a little and replaced two of the LV-T30's with LV-T45's for some gimbal steering. But when it comes down to it, if you are curious about how modifications will affect the design, I would encourage you to simply try it out yourself. You'll probably get your answer quicker and with more clarification seeing it with your own eyes. Yes. It already has low TWR and you think more thrust should be taken away? EDIt: checked. You actually have better performance in TWR. Still dabbling back and forth between build projects in Sandbox and my Career missions. One thing that has been on the back-burner for a while, like over a year, was a better way to explore Kerbin instead of suborbital rocket hops or ultra-long-range airplanes. And by "better" I also mean "more fun". The idea was originally outlined HERE (my God, October 2017?! ), but I've since determined that some elements of the concept aren't quite feasible, especially the large aircraft shelters. I wonder if I was drunk when I typed that. Setting up refueling sites across Kerbin is still a goal, but with a bit more of a modest and practical set of parameters. In some situations, you may need to access locations a certain distance away from the staging areas. It's possible that a river may present a boundary, such as on the continent north of the Dessert airfield; or conversely a river may be the only route to your destination due to restrictive terrain. 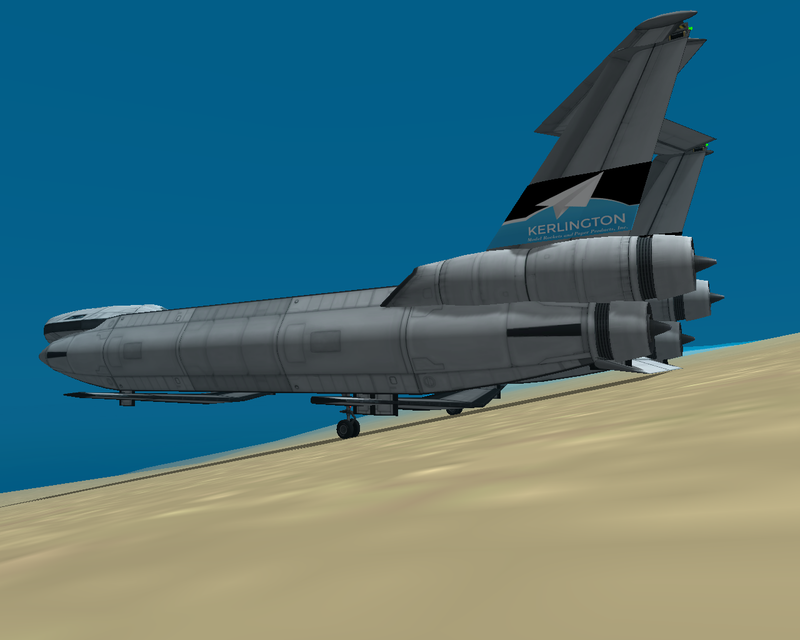 Exploring Kerbin will still be predominantly by air, but since there are some really hard to reach places on the ground, overland travel or sea travel may become necessary. Keep in mind this is just an example of something that I'm fiddling with. No clue if this will turn out to be practical or not. But it's such a departure from anything I've built before I wanted to post a screenshot because I'm really happy with how it turned out. Question: Would you consider the Lockheed Martin Lunar Landers (both the reusable version from Oct 2018 and the recent Apr 2019 2-stage) have too much overlaps with your existing landers? If you're asking if I plan on building either of them, the answer would be no. I already have several Mun-capable landers, both single- and two-stage, from 2x Kerbal to 5x Kerbal capacity. I briefly looked at a scaled-down, fuselage-stripped version of my LV-7A as a larger single-stage lander that would give a larger propellant margin compared to the LV-2C, but in the end I determined that the LV-3A and HLV-5A already fulfill that requirement since their two-stage modes aren't always necessary for the Mun. If you're askin﻿g if I plan on building either of them, the answer would be no. I already have several Mun-capable landers, both single- and two-stage, from 2x Kerbal to 5x Kerbal capacity. I briefly﻿ looked at a scaled-down, fuselage-stripped version of my LV-7A as a larger single-stage lander that would give a larger propellant margin compared to the LV-2C﻿, but in the end I deter﻿mi﻿﻿ned that the LV-3A﻿ and HLV-5A already fulfill that requirement since their two-stage modes aren't always necessary for the Mun. Yeah; I always believe that the primary reason to build anything that specific in KSP is whether it provides you the inspiration to do it. Whenever I build things out of more necessity than inspiration it usually turns out like crap. And thus far I haven't been inspired by Lockheed's lunar landers like I was with their MADV. However, I have wanted for some time to build a "vertical"-style crew lander that is dual-use for Vall and Tylo. The idea is a relatively large lander that is single stage, with the dV to make a round-trip to the surface of Vall and back to orbit without refueling. For Tylo, it would have enough dV to land on Tylo, after which it would be refueled on the surface prior to ascent. If it ends up looking like the single-stage Lockheed lander from last year, so be it. No clue if this will turn out to be practical or not. But it's such a departure from anything I've built before I wanted to post a screenshot because I'm really happy with how it turned out. It's GORGEOUS--I wish Photobucket would let me zoom in more. Hydrodynamic drag is three orders of magnitude less forgiving than aerodynamic drag. Little changes can make a huge difference in speed and range. I'm pretty sold on hydrofoils for longer range water work. I'm guessing the top speed of yours is in the low 20s or below? Cargo vessels in KSP need to be able to take a lot of abuse. Those ore tanks are going to get destroyed without very gentle handling. Below is a craft I'm working on for @Hotel26. It will carry 20 tons of cargo at a minimum of 40m/s for at least 300 km. Without cargo and nearly dry on fuel, I've gotten it up to 196m/s before it involuntarily departed the water. I've transitioned from the beach to the water at 50m/s with no damage. Adding on to that the additional time it takes to recover the rocket every...single...launch...and my motivation to launch anything is quickly overcome by the tediousness of it all. I would rather spend my KSP time exploring deep space or other planetary bodies. On a sidenote, have you tried using StageRecovery, and would you consider it a cheat for you?